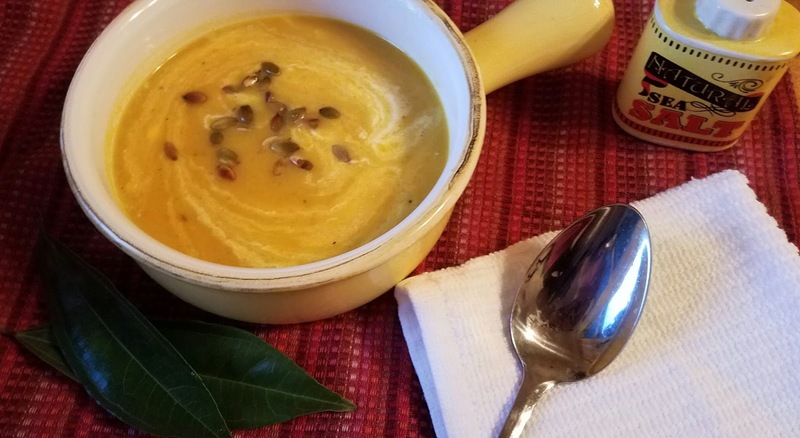 There were a lot of things I could have done with the pumpkins I cooked for this other post, but with fall weather slipping back into the Bay Area and another impending rain storm due next week, I really wanted to make a soup. A lot of recipes out there really lean toward sweet, with additions like brown sugar and apples, but I wanted to keep it savory. It's really simple, and can be adjusted to better suit your tastes with more or less ginger, added paprika, whatever makes your heart happy. Warm the butter or oil in a stockpot over medium heat and add the onions. Sprinkle 1/4 tsp salt on them. Keep the heat around medium low so you don't caramelize the onions, just let them sweat a little and become translucent, about 5 minutes. Add the celery, carrot, ginger and turmeric, and soften another two or three minutes. Add the pumpkin and stir to combine with the veggies, sauteeing for another minute or two. Add 1/2 tsp black pepper. If you're using low sodium broth, add another 1/4 tsp salt. Pour in the broth and the water, bring to a boil, reduce to a simmer and let cook, covered, for about 30 minutes for everything to come together. Use an immersion blender to puree everything together. Adjust salt and pepper to taste. Turn off heat and stir in cream. If desired, swirl in some sour cream and sprinkle on some toasted pumpkin seeds. Enjoy!